Of the 100 slokas of Soundarya Lahari, each of them are known to have the curative power against many a disease and misfortune. While composing the Narayaneeyam’, Narayana Bhattadri had a humanly incurable disease of the stomach. As he composed his songs he was sitting in the outer periphery of the sanctum sanctorum, directly leaning to the side and looking in to the Idol of ‘Chinna Krishna’. Krishna was giving his approval of each song by nodding his head. At the end of his ‘magnum opus’, Narayana Bhattadri had no stomach pain and he was fully cured of whatever was the disease. So chanting of Narayaneeyam is also used as a curative. From the collection of songs sung by Arunagiri Nathar, collectively known as Thiruppugazh, there is a song starting with the words, ‘Irumalu Roga Muyalagan Vaada...’, which is used as a panacea for all types of illnesses. Sambanda Murthy Swamigal cured Koon Pandyan, the King of Madurai of his fever and bent back, by singing ‘Thiru neer padigam’. This song is also used as a cure all, by being sung a number of times. While these slokas or songs are repeated a number of times, an effort is made to instil the power of such chanting in water or vibhuti, honey or milk, by either the sick person or someone else on their behalf and a drop of that water or honey or milk is partaken or the vibhuti applied to the forehead. 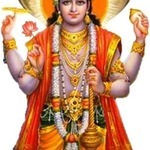 Gayatri known as the top most of all mantras, is also used this way. Vibhuti has some special power in this respect. In the colloquial it is called the ‘thunnooru’, though the Tamil word for that is, ‘Thiru Neeru’. We notice that the village folks receive this with reverence and apply it on their body and put some of it in their mouth too! Adi Sankara Bhagawat Paadaal has sung the ‘Subhrahmanya Bhujangam’ in which the 25th sloka talks of the vibhuti obtained at the Subrahmanya temple at Thiruchendur, having the power to cure all types of diseases! ‘That vibhuti has the power to cure by being seen for a fraction of a second,’ he says. There is no need to swallow it or apply it on the forehead, “vilokya kshanaat”, fits, fever, all types of incurable diseases, insanity, leprosy and mischief by supra normal spirits, will all vanish. It is said that the Moolavar Statue in Palani temple is made of a hardened material of extracts of herbs. So the Abhisheka Teertam has all the power of a curative. Similarly, the oil that has been anointed on the Guruvayurappan known as Guruvayoor Thailam, Thiruchoor Nei that is Ghee that has been applied on the Sivalingam at Thiruchoor, and many more such divine prasadams from many other temples, are said to have such powers. You make a prayer to Venkata Ramana Swamy Balaji at Tirupati that, ‘you will come walking up the foot path route’ or ‘do anga pradakshinam in the temple praharam’ or ‘present a mangalyam’ or ‘conduct the marriage ceremony of Balaji with Padmavaty Ammavaru’; presto any and every long standing problem or disease disappears! Parameswara the Siva too, cures us of not only the disease named ‘this worldly life’, but also any and every other disease too! He is known as ‘Vaidya Natha Swamy’ in Vaitheeswaran Koil, as the Doctor of all Doctors! As a tradition, the devotee is required to dissolve some salt or jaggery in the temple pond, for solving of whatever the problem! You take a clutch each of Bilva (belladonna) leaves lovingly offered to Siva, Tulasi (holy basil) leaves offered to Vishnu and the bitter Neem leaves (Veppilai in Tamil) that is the favourite of Ambal and eat it every day, to be impervious to all sorts of diseases and infections! Even the wind blowing through a Neem tree is said to be capable of cleansing the blood in the human body and removes infections of the uterus and the womb. Similarly Arasa Maram is also known to have curative qualities. It has been an age old custom in India to plant a Neem Tree and Arasa Tree close to each other and conduct a symbolic marriage of the two. Those who have no children, even after years of being married, should perambulate around the tree-couple, to get in the family way, is the advice of a Naattu Vaidyar in a book that I have read! The waving of lit agarbathi (incense sticks) and burning of camphor in Poojas and use of cow’s dung to spread and smear the floors in mud houses; are all done not only as a ritual but with an additional purpose of disinfecting the surroundings as a preventive against diseases. More than all this, with unshakeable trust in God and destiny that come what may, whatever happens, however the way it happens, is taken as the best for oneself, it becomes a positive input into the system! Then your resilience becomes so powerful that you do not go under but, overcome any and every disease! In this the mantra-s (not mentioned in Ayurveda), the mani, oushadi from herbs, neem, arasa maram, cow dung are all included.